Here's Barielle's collection for summer! Belly Dance. This is interesting- it's that taupey-mousy-putty color with a touch of purple that's been so popluar the past few years, but instead of being a creme as they usually are, this one has a little bit of very fine silvery shimmer. It's subtle shimmer, but it gives the polish a little something extra. Electric Boogie. Hell yeah!!! Shimmery deep blue with green glitter!! Thanks for making this, Barielle! Easily my favorite in the collection, though this polish does have one tiny flaw. It is very thick. You may need to add a little polish thinner to this to make it usable. Freestyle. A different take on this year's mint trend. This is a silvery, shimmery frosty pastel mint with tiny silver microglitter. You may have to enlarge the picture to see the glitter, but it's there and it's fairly abundant. Usually when you have a frosty polish plus glitter you end up with a chunky/lumpy end result, but this one works. The glitter is so fine that it seems to float in the polish instead of adhering to the nail and becoming lumpy, and the frosty base is sheer and light enough to allow the glitter to show through. So, what you get is a light ethereal green that sparkles like crazy. Night Moves. Silver foil. Super sparkly. Not as dense as say.... Zoya Trixie or Orly Dazzle. Slow Motion. Super light frosty metallic pink. It's not totally pink- it's a little silvery and just barely lavender toned. Now normally these types of colors send me screaming and running in the opposite direction, but when I was applying this one for this picture I couldn't help but think that this looked really clean and bright. It still looks that way to me... bright and clean and shiny. Passion Pirouette. This is a purple metallic frost. This one is pretty unique, too. I haven't seen many frosts in this particular shade. It's really rich, not faded or too soft looking. Metallic grapes! The formula on these was okay. Electric Boogie gave me trouble because it was so much thicker than I'm used to, even from Barielle which tends to be on the thick side anyway. Like I mentioned above, you may need to thin yours. Other than that, these applied very well. I did three coats of all, most only needed two but Night Moves and Slow Motion needed three. Unfortunately, the drying time on this is very long. 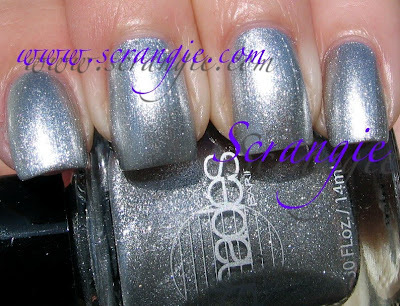 I was still denting Electric Boogie two hours later with Seche Vite. Maybe cause it was so thick? I haven't worn the other shades as full manicures yet, so I don't know. This collection looks really retro to me. Judging from the names, I'm thinking that was the point. Kinda disco-like. Frosty. Sparkly. Luckily they aren't all frosts! Electric Boogie is gorgeous, I haven't seen a color like this since... since... Uh... When was the last time someone did a dark blue shimmer with glitter in it? Sephora Metallic Sapphire? I don't even remember, it's been a while! You of course make them look lovely, but I think they are just too frosty for me to get on board. Electric Boogie being the exception! Oooh, the electric blue is pretty and the finishes are interesting, but not entirely lemming-worthy. We don't get Barielle in Canada, so that saves me some cash. I just got a Head2Toe haul yesterday, inspired by your Orly post...dangerous woman! I knew i would want Belly Dancer, but now I want Electric Boogie too! Thanks Love! These are pretty. But I'm excited to see your swatches of the OPI Shrek polishes when they come out. Those greens look funky! Pretty pretties. I actually like all of them except Passion Pirouette, which I'm just not feeling for some reason. Barielle has such nice polishes. Electric Boogie is gorgeous! I think China Glaze has a blue shimmer with glitter... Eyes Like Sapphires? The only one I want is Electric Boogie. I'am really not a fan of frosts. Belly Dance is my favourite shade out of the bunch, although I really dislike the name because it reminds me of those yogurt commercials. I just tried my first ever Barielle the other day, can you believe it? I like Belly Dance & Electric Boogie a lot but the rest don't really appeal. Are frosts having a comeback? I must be the only one thinking these are retro in a bad way. Way too frosty for my taste. I was hoping Barielle would have done something... more summery. :( Great pics though! I like Belly Dancer and Freestyle.Scrangie,how do you keep your nails so pretty? They are a gorgeous shape! Frosts. No thanks. I do like Belly Dance and that's about it. I also don't like the way they package things. They sent me a couple of polishes just loose in an envelope. No bubble wrap. Luckily they weren't broken but I thought that was shoddy. They have some great polishes but these aren't too clever. Glad to know I'm not the only frost-hater around! I was honestly very surprised to see a collection that was mostly frosts. Wonder what their vision was? I'm not big on frosts...also not big on the whole taupe thing, yet something about Belly Dance intrigues me. Maybe it's the shimmer. I'm enjoying Belly Dance but wondering how close it is to NautiGal, which came out in either the Spring or Summer collection last year? And which I also love for its little shimmer.